We are thrilled to have Kathleen Tailer with us today. She’s here to tell us about her new Love Inspired Suspense book and her writing process. When I first started writing, I wrote straight through the book from start to finish. Now that I’ve been doing this a bit longer, I’ve started outlining my work ahead of time. I still find myself making plot changes as I go along, because sometimes, a new idea hits me midstream or something just doesn’t seem right once I get it on paper. Still, using the outline helps me organize my ideas. 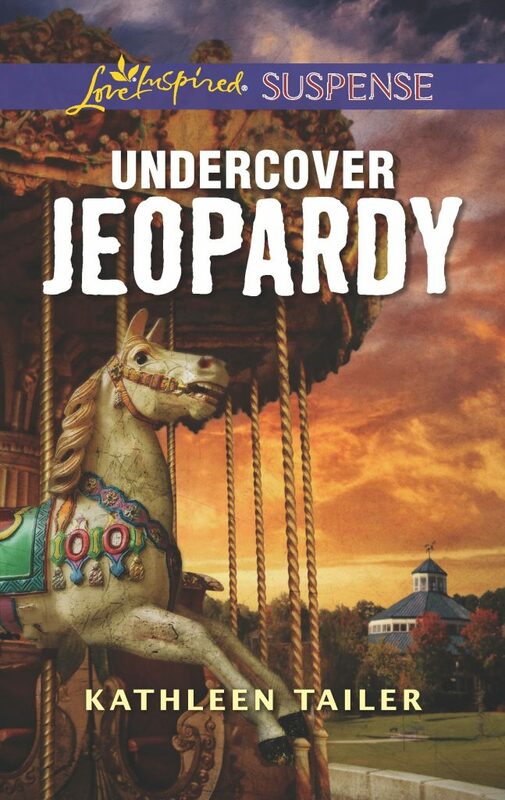 Undercover Jeopardy, your April 2019 Harlequin Love Inspired Suspense title, was recently released. Can you tell us a little bit about this book and what inspired you to write it? I read an article about a gentleman who was undercover for several years, and he spoke about the difficulties and sacrifices he’d had to make to do the job. The more I researched and learned about undercover work, the more I liked the idea of using that facet in my book. How do you choose the locations for your books? I usually like to describe areas that I’ve visited or lived in, and since I’ve had two daughters go to school at Covenant College near Chattanooga, that setting was perfect for Undercover Jeopardy – especially since I named the hero and heroine after my daughter and her new husband who still live in the Chattanooga area. That made the story even more fun for me to write – even though the characters in the book are nothing like the real people with those names. For Perilous Refuge, I was able to take a trip to Maui with a dear friend, and I found the location so enchanting that I took pages of notes so I could write about it once I returned. Since I live in Tallahassee and travel a lot for work around the state of Florida, many of my novels take place in my home state. In your own words, can you describe what defines Harlequin Love Inspired Suspense? Clean, suspenseful romance! My favorite aspect of this line is that the characters aren’t perfect. They are Christian, but they make mistakes, just like the rest of us, as they grow through their experiences. Anne Gracie is one of my favorite historical romance authors, and lately, I’ve been re-reading some of her books that are on the top of my list of favorites. I also like Susan Sleeman’s work, and dove into several of her books, as well as those by Dani Pettrey and Terri Blackstock. In February, I helped Judge the RITA contest, and enjoyed reading some manuscripts from new authors that are just starting out. I love to read! Never give up! Also, make sure you are writing what the publisher sells. The key is to write what the publisher wants and follow the publisher’s guidelines. For several years, I tried to sell ideas and manuscripts to publishers that just weren’t a good fit. With the internet and a good search engine, the writer’s guidelines are much easier to find and follow than they were in the past. Kathleen Tailer is an attorney that works for the Supreme Court of Florida in the Office of the State Courts Administrator on dependency and domestic violence programs. She graduated from Florida State University College of Law in 1993 after earning her B.A.from the University of New Mexico. Kathleen is passionate about adoption and finding Christian homes for orphaned children. She and her husband have adopted 5 special needs children in addition to their three biological children.